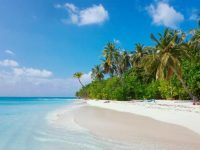 Editor’s note: Written by Nikhil Chinapa, the article was sent to share his experience of Maldives with us. 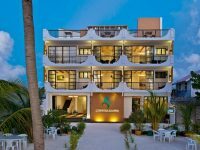 The article was also published in Maldives Finder, and the publisher being a friend of Maldives Promotion House decided to put it up on our site. 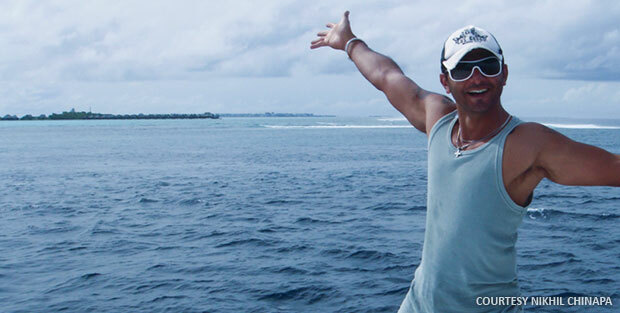 Nikhil Chinapa – 95 dives completed. That was in January 2010. I knew that the next time I went diving, I’d hit 100 dives and though they’re a far cry from my buddy Shaff (who has well over 3,000 dives logged), I wanted the 100th dive to be special. So I considered diving in a 3 piece suit, diving naked and diving with great whites. Much thought and time was spent as to how and where I’d do my 100th dive. Ok, That’s not entirely true as most of my time was spent partying, dj-ing and drinking lots of beer across various nightclubs in India. However when conversation amongst friends wandered around to diving, I did wonder where dive #100 was going to be. The pieces of the puzzle finally fell together when I got a call from the Maldives. I’d more-or-less decided that it had to be the Maldives. I’d done most of my diving here and I wasn’t particularly gung-ho on a stunt dive or dive where I was going to be bitten by a shark , an eel or a Napoleon Wrasse looking for a banana. I wanted great visibility, warm water and a fun bunch of friends around me when I went diving. My buddy Shaff had been pestering me for a while to accompany him to a spot that was teeming with Manta. I’d never found the time to make it happen, but the wheels of fate were in motion. Shortly after these exhortations from Shaff I read a piece in the National Geographic that had an article on Manta in the Maldives – in one particular area. It had been documented as a place where mantas and whale sharks gathered between the months of July and September to feed on plankton that had been drawn up from the deep ocean and then funneled into a particular bay by the prevailing monsoon ocean currents. It was a place called Hanifaru Bay. It’s a tiny dive spot, ostensibly in the middle of nowhere, but in reality quite well known in Baa Atoll in the Maldives. The dive site has over the past few years, become quite well known across the world and the Maldivian government has now designated it a protected Marine Reserve. 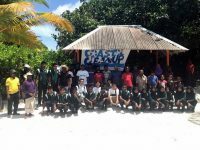 We got to Baa Atoll on the Atoll Cruiser live-aboard along with 12 other divers – mostly from India. The journey from Male had taken us a day, during which check dives had been completed and a juvenile humpback whale had been sighted. Rather rare in the Maldives apparently, but then so are a bunch of Indian divers on a live-aboard! The dive site at Hanifaru bay looked like – well, like nothing really. It looked shallow and had a reef ridge running on the outside, with a channel beyond. Islands were all at a distance and to the first timer, it looked like the dive guides had either lost the location, or had just run out of ideas. Underwater, the visibility was poor (hello plankton!) and there were a few coral blocks. Maximum depth – a grand 12 meters. The first dive was largely uneventful. We wandered around, lost; sat by a coral block for 15 minutes and saw one passing manta. Some of us in a group tried wandering across to some other coral blocks and spotted, well not much. Hanifaru bay was certainly not living up to its reputation, nor was it anything like what I’d seen in videos on YouTube. Now I won’t lie to you – my 100th dive was actually quite ordinary. We saw some Manta on that dive and may have even seen a turtle and some of the Maldives brilliantly coloured reef fish. The odd lionfish was also observed, as were schools of scuba-diving tourists with the obligatory cameras in hand. My 99th dive however, was the kicker. It was a dive that I for one, won’t forget in a hurry because it was the first time I saw a whale shark. 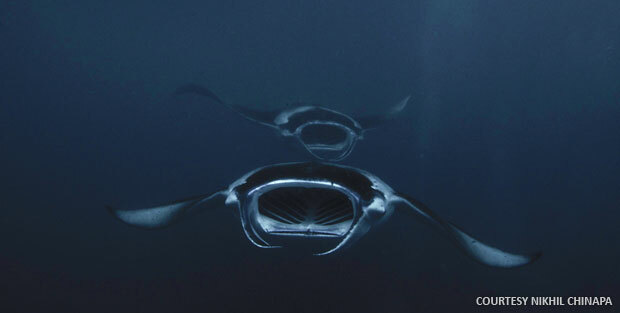 It was also the first time that I saw over 50 mantas on a single dive – and they looked like clouds of dive-bombers descending from the surface towards us. Now I never usually carry a camera underwater, preferring to instead drift along and watch the world go by. I don’t particularly like being stuck behind a lens for my entire dive, desperately trying to capture pictures to post on Facebook or to boast to my friends with. It works well for me as my regular dive buddy Shaff is an avid underwater cameraman and has a brilliant camera to boot – I just “borrow” his pictures and video to make my albums and my dive video edits! However on this dive, a friend gave me his spare camera, set it to picture mode and asked me to take pictures “if anything special popped up”… and pop up it did. We entered the water over a shallow sand bank and descended to the bottom – which was about 5 meters. 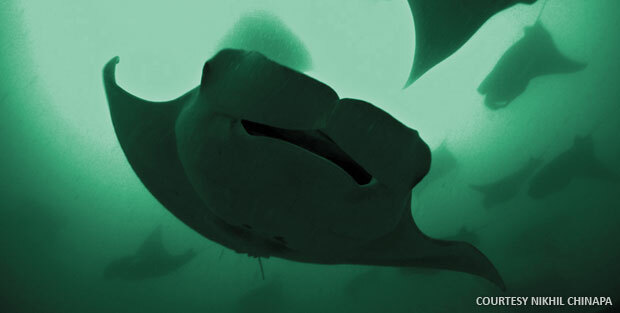 We started to swim towards deeper water, where we hoped the mantas would appear sooner or later. As I swam slowly towards deeper water and the sand bank started to fall away beneath me, I casually turned to glance over my left shoulder… And appearing out of the plankton haze – not more than 20 feet away was the biggest whale shark I had ever seen in any video! I grabbed the camera and desperately began the 3-step process to switch from picture to video mode. It took me a few seconds and by the time I got it ready, the whale shark was almost at touching distance. I swung the camera up and stabbed at the record button and managed to shoot the best whale shark shot of the entire dive trip! Her snout went right by the camera and the entire animal swam slowly past me at a distance of just a few feet. My dive holiday had been made… but there was more to come. 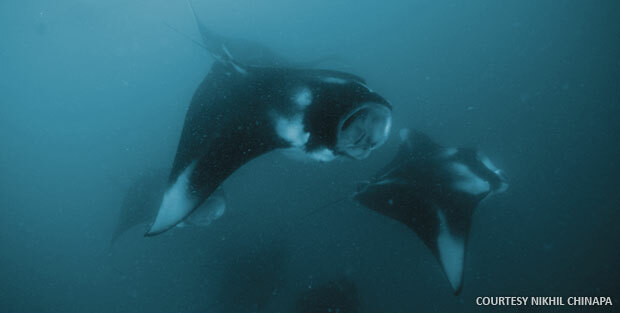 As we swam towards the now familiar coral block, the mantas appeared. Clouds and clouds of them with flowing cephalic fins guiding plankton rich water into their gaping mouths. Most were at the surface and could be observed by snorkelers, while divers desperately tried to maintain their buoyancy at 3-4 meters to be in the middle of the feeding rush. 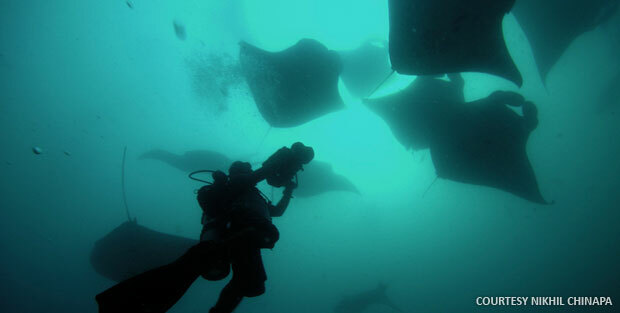 Incredibly, as mantas rushed over, around and under you, they were acutely aware of the divers and where other mantas were. I never once saw any collisions or felt like I was in danger of being knocked over by one of the giants. We swam with them, did clumsy loops as they passed over our heads and watched as they chased their own tale in acrobatic loop-de-loops when they hit a particularly rich plankton spot in the water. After a while I drifted down to the bottom and lay down beside the coral block to observe a single manta allowing itself to be cleaned by the army of cleaner fish. The next 20 minutes were pure nirvana. This lone manta was almost in performance mode. It swam ultra-slowly and often a few feet over me as I lay on the sand and rolled over on my back to watch it swim overhead. It was like having my living room fly over my head; it was that huge (or looked like it underwater). On one occasion, it opened it’s mouth to the cleaners as it flew over my head and I swear – it felt like I could just reach my hand up and pull myself into it’s gaping mouth – it was THAT close. What started off with just me watching this one manta, ended 20 mins later with over 20 divers lying on the sand around the coral block behind me. It was magical. The rest of the dive was occupied by watching more manta (the guides estimated there were over 400 in the bay that day) and the whale shark as it made more runs past us. So dive #99 was better that #100. But is any dive in the Maldives ever a waste? 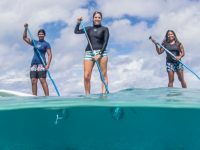 I’d say no- the visibility, the company and just being underwater in warm water more than makes up for anything that you may not see… or for that matter, is nicer than anything you do see. It’s been 4 months since I dived at Hanifaru and with visions of that lone manta drifting lazily over my head, I can’t wait to get back to the Maldives again! About the Author: Nikhil Chinapa is a famous MTV presenter, an Indian radio jockey, video jockey and disc jockey. He is also a keen diver.